A potential cure for the fatal disease GM1 gangliosidosis, which is nearing clinical trials next year, could one day also be used to treat more commonly known diseases like Alzheimer’s and Parkinson. Dr. Heather Gray-Edwards and Ashley Randle, a veterinary clinical fellow, perform an ultrasound on a cat’s brain. Dr. Doug Martin, a research scientist at the Scott-Ritchey Research Center at the Auburn University College of Veterinary Medicine, says the gene therapy vector developed with collaborators, which is currently being vetted for human clinical trials in 2017, could be a breakthrough for other diseases. GM1 gangliosidosis is a lysosomal storage disease that attacks the brain and spinal cord, a progressive and degenerative condition that is always fatal in children. Dr. Martin, part of a team of researchers in the Tay-Sachs Gene Therapy Consortium, an international collaborative group of scientists committed to searching for a cure, developed and tested the vector based on the adeno-associated virus (AAV). Currently, Lysogene, a French-based clinical stage gene therapy biotechnology company, is developing pre-clinical studies for the vector. 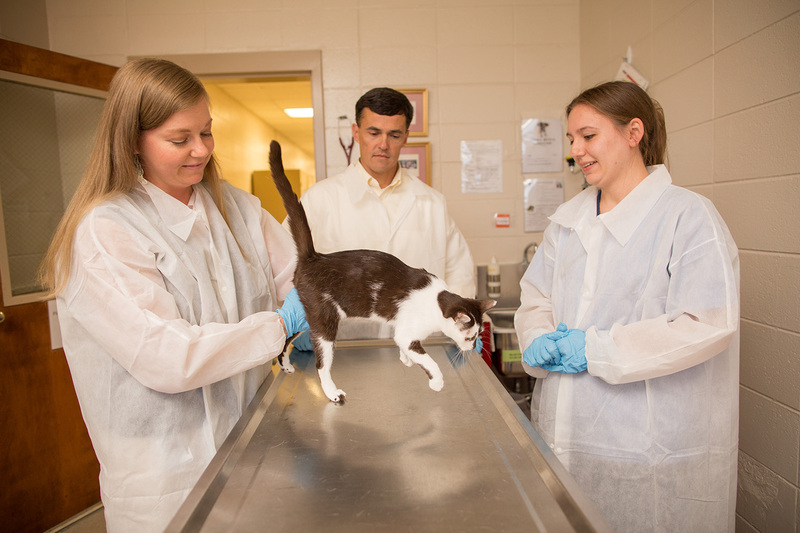 Ashley Randle, a clinical veterinary fellow, Dr. Doug Martin, and Jessica Cannon, an animal specialist in Scott-Ritchey, examine Jo. The development of a treatment for GM1 gangliosidosis using AAV gene therapy was initiated in 2005 by Martin, an associate professor in the Department of Anatomy, Physiology and Pharmacology at Auburn, and Dr. Miguel Sena-Esteves, associate professor in the Neurology Department and director of the Gene Therapy Center at the University of Massachusetts Medical School. GM1 glangliosidosis is caused when the body does not produce enough of a specific enzyme, β-galactosidase (βgal), which recycles molecules from the body. When the molecules build to abnormal levels, they progressively destroy the body’s nervous system. The earlier the onset in children, the quicker the disease kills. Dr. Sena-Esteves and Dr. Martin re-engineered the virus to introduce the gene that produces βgal. The virus acts as a vessel, its genetic material removed and replaced with a concentrated dose of the βgal gene. Healthy cells pass along βgal, essentially allowing deficient cells to soak in the crucial enzyme. The experimental therapy has extended the lives of cats, which have a similar genetic defect, from an average of eight months to more than 52 months, with no ill effects and with normal function. 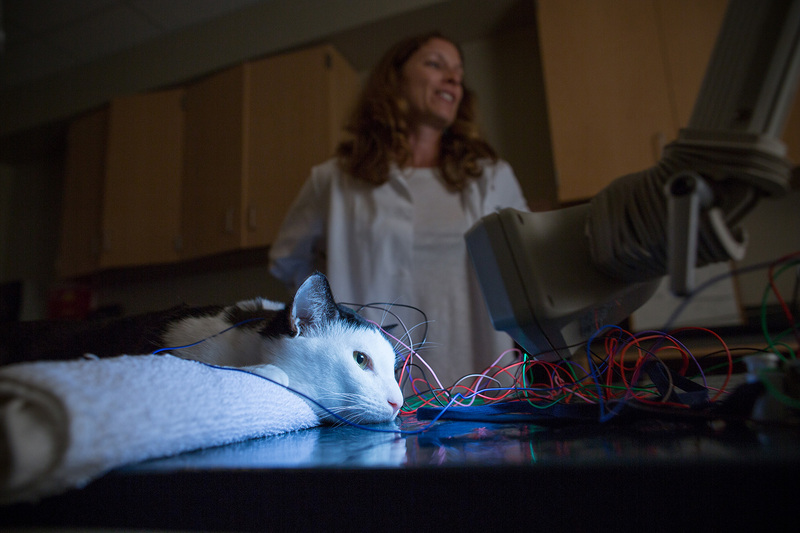 Dr. Heather Gray-Edwards performs an electroencephalogram (EEG) on a cat to measure brain wave activity. Dr. Martin and a team of researchers have found success in administering the virus two ways: the first, and most successful, is by intracranial injections through the skull, which has succeeded in getting therapy beyond what is called the blood-brain barrier. This option is moving toward clinical trial the fastest, he added. The second is the development an IV treatment which provides sufficient doses to the brain through the blood system. “This method is very promising but we have to administer more of the vector to ensure enough of it is in the brain,” he added. What researchers need now is funding to move the process along. “Time and money are a factor,” said Dr. Martin. Funding will allow researchers to complete necessary and important regulatory mandates and to perform toxicity and bio distribution studies in normal mice, both required by the FDA to demonstrate safety of the vector that will be used to treat children.